Paris Motor Show. Through this signature, the new concept car asserts the Brand's unique spirit and enhances the strengths of the production version. In its XS version, the SpaceTourer 4X4 Ë Concept features a 4WD conversion, protection equipment and graphic components outside together with a special interior layout that make it a stylish, practical and contemporary adventurer, firmly focused on escapades and well-being. Aesthetically, the Citroën SpaceTourer 4X4 Ë Concept introduces a subtle approach to colours and materials inside and out, lending it a sharp graphic presence and an energetic look. Combining the best features of vans and SUVs, the design above all emphasises the concept car's all-terrain abilities. The SpaceTourer 4X4 Ë Concept is equipped with special front and rear protective skid plates and roof bars with a satin aluminium finish. Recognizable with its "4X4" logo under the door mirrors and on the tailgate, it also features tyres with snow chains. While its flowing and unaggressive body styling initially evokes vitality and balance, the SpaceTourer 4X4 Ë Concept emphasises the model's original styling with original body paint. To visually boost its personality, the SpaceTourer 4X4 Ë Concept is cloaked in a special Technical White colour on the front and tailgate. The profile and the bonnet are adorned with a hip camouflage design in Technical Grey hues and enhanced with a red decal. Touches of the same red colour punctuate the wheels, equipped with 19-inch rims in dark chrome. Enhancing the strengths of the production model, the SpaceTourer 4X4 Ë Concept is the perfect companion for adepts of design, well-being and leading-edge technologies on all types of terrain. In addition to its exclusive and elegant styling with the same colour-and-material cues as the collection of the same name, it also reasserts the Brand's signature and unique know-how. The "Ë" capsule collection is a line of modern and technical lifestyle products realised in a limited series. The name refers to the singular grapheme central to Citroën's identity and pronounced with an umlaut. Designed for unlimited adventure and powered by the BlueHDi 150 S&S diesel with a 6-speed manual gearbox, the SpaceTourer 4X4 Ë Concept boasts top-level all-terrain abilities and ride comfort whatever the environment. For intensive use it is equipped with a special disengageable 4x4 transmission. 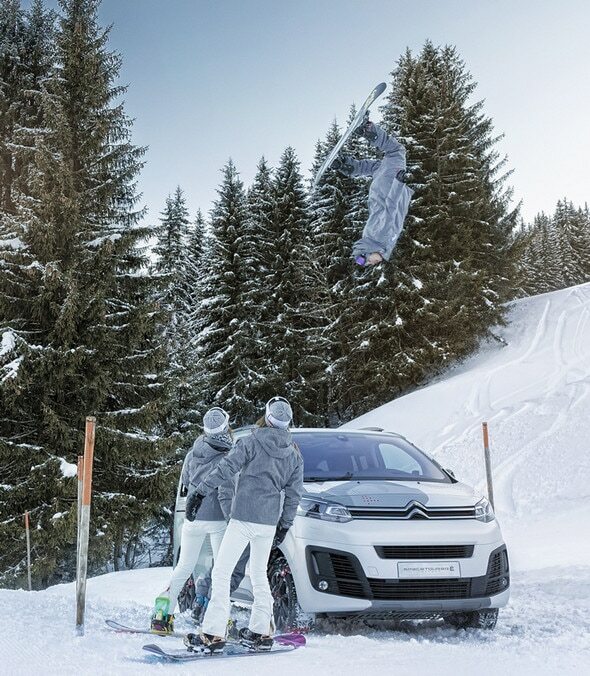 This 4WD conversion, also feasible on the production version of the SpaceTourer and already available on special order in the Citroën network, was realised by the Brand's partner Automobiles Dangel, a French all-terrain specialist. Offering even greater motoring freedom, the drive train offers 4x4 abilities while safeguarding the roadholding and intrinsic performance and safety of the SpaceTourer. The all-terrain system ensures traction in low-grip situations. Drivers can get themselves out of sticky situations thanks to the car's rear axle lock system controlled via a thumbwheel on the dashboard. The 4WD conversion is even more efficient on the XS version. Thus equipped, the SpaceTourer is even more effective on difficult surfaces. The SpaceTourer 4X4 Ë Concept's sliding side doors open on to an impressively spacious interior with a warm design scheme in which each component is handsomely appointed. Highlighted by a broad glass roof with its two separately coverable sections, the personalisation work inside is most evident in the dashboard and upholstery. The blue, white and red colour scheme pays a nod to the graphical world inspired by the "Ë" capsule collection. Taking the form of cloth strips and piping, the colours subtly celebrate French heritage and forge a new aesthetic. The seats are upholstered in soft and warm materials. White leather graces all the upper seat backs and headrests. On the lower two-thirds of each seat, mottled grey alcantara leather creates a stunning visual contrast. Ideal for "tribes" of families and friends looking for stylish and relaxed motoring adventures, the Citroën SpaceTourer 4X4 Ë Concept has a high-set driving position, a warm interior and peerless comfort. As befits a functional and welcoming vehicle, boot access is enhanced by the opening rear window and cabin access by two hands-free sliding side doors. This last feature is a first in the segment. Motorists can open and close the doors with their hands full and comfortably access 4/5 the Citroën SpaceTourer 4X4 Ë Concept. closed storage spaces (door bins) ingeniously located around the cabin. There is also sufficient space in the back to house a snowboard, leisure accessories or other items from the "Ë" collection. 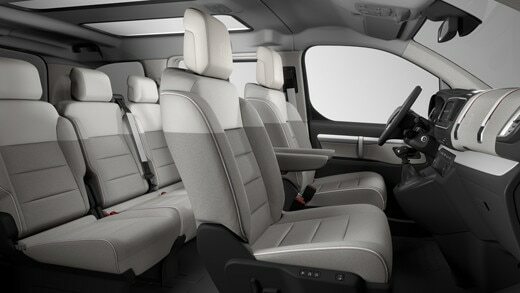 The concept car has a load volume of up to two cubic metres in this five-seat layout.